The Apple Event on September 5th with Steve Jobs was really stunning. 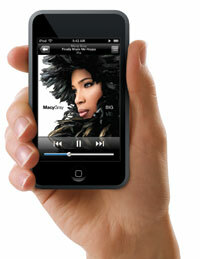 The complete iPod product line is renewed and Apple created even a new type of iPod: the iPod touch. On the first look this is just a further development of the iPod-portfolio for watching movies in widescreen on the move. But it is far more – it’s a revolution! Until now, iPods have been music playing devices … only some 3rd-party accessories enabled the iPod to record audio and you also can play some games on them. But the new iPod touch goes far beyond: WiFi/WLAN and the built in Safari webbrowser transform the music- and video-player into a mobile internet surfing terminal. On the one hand, Apple stimulates developers to create especially optimized webpages and content for the iPhone and the iPod touch. On the other hand this is the opportunity for the company to sell a mobile internet gadget worldwide without struggling with the mobile network operators (MNOs) in every single country. For users and developers around the world this is really great news: faster availability for mobile internet devices à la Apple. Casually mentioned Apple is positioning the iPod touch as a competitor to the Sony Playstation Portable. The PSP is coming from the field of gaming-console – but it satisfied also the needs for small and handy WiFI/WLAN internet terminals and a mobile video player. Now Apple is offering two ways to satisfie the growing user needs for mobile internet. As a all-in-one device as the iPhone and as a mobile WiFi/WLAN mobile internet sufing device as the iPod touch. I actually found post on digg as well, and I think you’re on the mark here. iPhone/touch developers have newfound motivation, consumers have more reasons to use them (since most of us are looking for convenience and convenience Apple delivers, starting $299). I am really trying to get the iPhone and I need your help! I need my fellow bloggers to help me with referrals! This is my website http://www.appleiphoneforfreenolie.com I have proof that it is legit and also step by step information on how you can help me get an iPhone and in return you can get one yourself!